*Disclaimer: we do not buy or sell leads. This page is an overview of the student loan lead generation industry. The student loan industry continues to grow at an extreme pace as the need for student loans and student loan consolidation continue to rise. According to IBISWorld Market Research Report, government cuts in education funding and outside economic factors have contributed to an increase in tuition costs, additional education costs and a higher average amount of debt for students. In fact, student loan debt, which now totals well over $1 trillion is the second highest consumer debt category behind only mortgage debt. Along with rising costs and an increase in total debt, many students still struggle to find a job after graduating college. This has made these high debts even harder to pay for the average student. Not only has the need for student loans and student loan consolidation dramatically increased, recent changes in federal law regarding the student loan database and access to it has given lenders new opportunities to target these students. This is where lead generation comes in. More than ever, lenders are profiting from student loans and are looking for new ways to get in contact with students that need financial assistance. Because of this, student loan lead generation has exploded and will continue to grow for the foreseeable future. If you are already operating in a student loan vertical, you already know how profitable it can be. If you are looking to expand your business to student loan leads, now may be the perfect time. 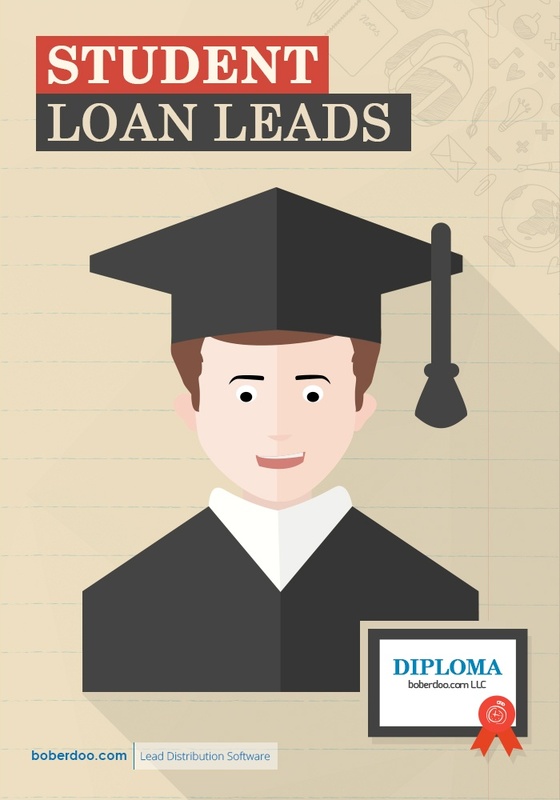 Generating student loan leads is similar to most lead verticals. Luckily, the standard student loan form is fairly short and straightforward often giving you the filter options of State, Loan Amount and optionally the fields of Number of Loans, Graduation Time and more. Many marketers generate these leads via email marketing, social media marketing, outbound call centers, Click2Call technology and live transfers. The boberdoo system and it’s real-time lead distribution features are the standard in the industry. With the most advanced distribution options, custom deliveries to any CRM or LMS and a plethora of billing options, boberdoo provides a complete back end system for running not only your student loan lead vertical, but your entire lead business. Our real-time web lead distribution and form building options are perfect if you are generating leads via an online form. Additionally, our standard, out-of-the-box solution can handle all leads generated via calls (both inbound and outbound) as well. If you are looking to upgrade your lead generation business or break into the student loan vertical, you can do no better than boberdoo.com. If you would like to discuss student loan leads or the boberdoo lead distribution system, please give us a call at 800-776-5646.
boberdoo builds lead distribution software for lead generation companies. We also have a few other services such as Premium Dashboards, Outbound Automation and leadQC. We DO NOT SELL student loan leads. If you are looking to purchase leads, please submit an inquiry and tell us who your current suppliers are and we can make introductions to boberdoo clients in that vertical.